PORT MORESBY, Papua New Guinea (AP) — Disgruntled police, military and prison guards stormed Papua New Guinea’s Parliament on Tuesday in a violent pay dispute stemming from an international summit hosted by the impoverished South Pacific island nation over the weekend, a lawmaker said. Images posted by opposition lawmaker Bryan Kramer on social media showed broken windows, smashed furniture, pictures torn from walls and plants tipped over. Parliament’s security check point including a metal detector was trashed and doors were destroyed along with their fingerprint-reading locking systems, Kramer said. The Asia-Pacific Economic Cooperation meeting was attended by U.S. Vice President Mike Pence, Chinese President Xi Jinping, Japanese Prime Minister Shinzo Abe and others. Kramer said he did not see anyone use a weapon in the conflict and he was not aware of any serious injuries, although there were spots of blood throughout the building. Kramer and his opposition colleagues remained in a meeting room within the Parliament building throughout the 30-minute attack. Following the rampage, more than 100 police, military personnel and prison guards waited outside Parliament demanding to be addressed by the government about their allowances, Kramer said. But they eventually left the area. Working police later provided security for parliamentary staff in the building and patrolled surrounding streets. The violence at Parliament coincided with reports of looting of surrounding businesses, as criminals apparently took advantage of the breakdown in law and order. 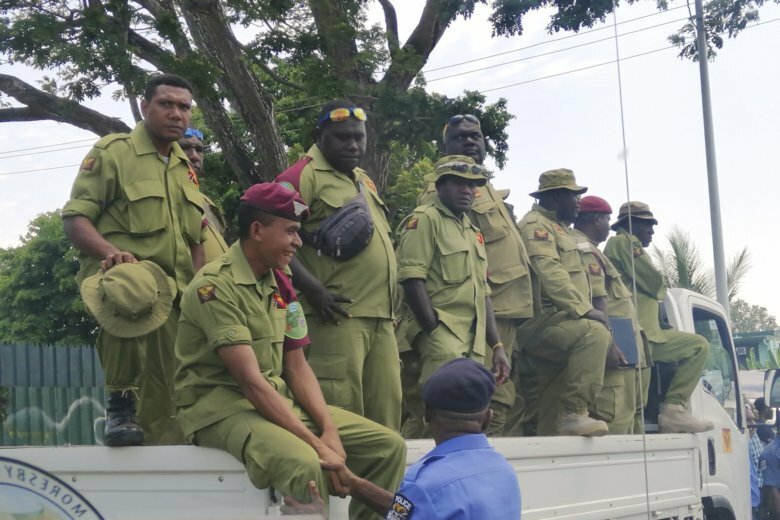 Neither Prime Minister Peter O’Neill’s office nor police chief Superintendent Dominic Kakas immediately responded to requests for comment. Acting Correctional Services Commissioner Stephen Pokanis confirmed to the Australian Broadcasting Corp. that the protesters went to Parliament to demand the immediate payment of APEC allowances. Papua New Guinea APEC Coordination Authority chief executive Chris Hawkins said allowance payments to security personnel after a major event would normally take a week. Papua New Guinea is a largely undeveloped Pacific nation of more than 8 million mostly subsistence farmers with widespread poverty, corruption and lawlessness. The annual APEC summit brought together representatives of 21 nations that account for 60 percent of the world economy. What’s been called Papua New Guinea’s global coming-out party has caused both pride and discord and underlined the yawning gulf between a small well-educated minority and the poor, who include the 85 percent of people living in the highlands and other remote areas. Ahead of the APEC summit, the government was criticized for acquiring a fleet of 40 expensive Maserati cars to ferry the world leaders to meeting sites, but it assured citizens that the vehicles would be sold afterward. A VIP terminal costing about $19 million was added to the city’s airport. Construction of an iconic building called “APEC Haus” for the summit was paid for by oil and gas company Oil Search, which operates all of Papua New Guinea’s oil fields, in exchange for tax credits. “I think the money should have been used to fix our backyard instead of decorating the front porch. We have health, education and infrastructure deficiencies that need to be addressed,” activist and writer Martyn Namorong said before the summit.